In August 2017 UCL IEDE and the Energy Institute took part in the Building Simulation Conference in San Francisco. 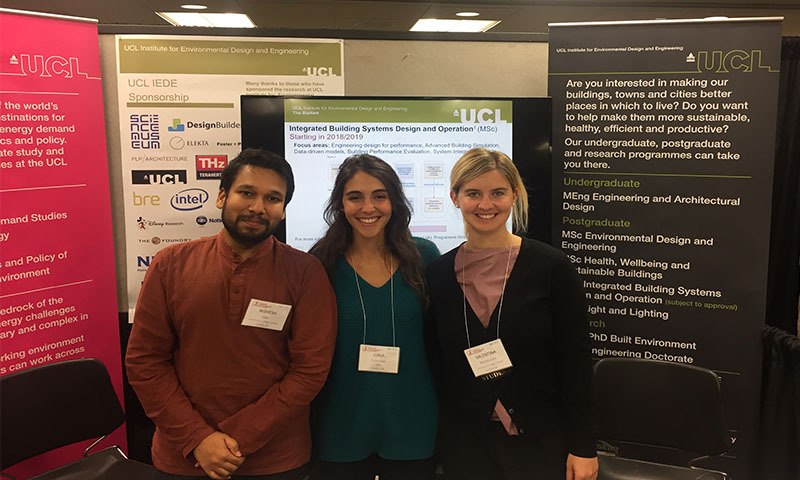 The UCL Institute of Environmental Design and Engineering and the Energy Institute participated in the 15th biennial Building Simulation Conference in San Francisco. Organised by the International Building Performance Simulation Association (IBPSA), the Building Simulation is a leading conference in the field, where academia and industry share the latest findings in building performance simulation, advanced modelling and examples of best practice. The conference brought together design practitioners, software developers, building physics researchers and students allowing the exchange of simulation ideas and methods from an international perspective. Parallel sessions covered various topics, ranging from whole building performance simulation and models’ calibration to stock modelling for policy evaluation and indoor environmental quality. UCL had a significant presence in the conference with many students, researchers and academics contributing. The work presented highlights the diversity of the research undertaken within UCL: from energy performance contracts, agent-based occupant modelling, hygrothermal simulations, to parametric optimisation and metamodeling. In total ten papers were (co-)authored by UCL-affiliated people and two UCL academics, Dr Dimitrios Rovas and Dr Ian Hamilton, chaired sessions on building controls and on building stock energy mapping. Professor Dejan Mumovic chaired a panel that discussed the Total Performance of Low-Carbon Buildings – UCL, Tsinghua University, Buro Happold and AHR Global Architects shared their expertise on the issues related to building performance and the research methods used to tackle these issues. Professor Pieter de Wilde, from Plymouth University and Chair of IBPSA-England, also shared his insights into the problem of the performance gap. Different approaches to the energy performance gap and the issues associated with poor-indoor air quality observed in some new buildings were discussed. It was suggested that ‘energy & environmental’ performance contracting can help close these gaps. An outline and preliminary results of a novel approach to use System Dynamics along with building simulations to investigate the impacts of communication and collaboration among construction teams on the quality of a building were also presented. The IEDE team received very positive and helpful feedback that will support the ongoing activities within TOP, a collaborative research project between UCL and Tsinghua. UCL IEDE and the Energy Institute had a stand in the exhibitors’ area. This was an opportunity to inform participants of the breadth of education opportunities offered and the range of undergraduate and postgraduate programmes offered. The stand proved to be a meeting point between UCL staff and alumni. The conference proceedings will be soon available on the IBPSA website.